Cefprozil, an antibiotic used to treat bacterial infections, was labeled with 99mTc. 99mTc-cefprozil was prepared by adding 99mTc to cefprozil in the presence of 50 µg SnCl2.dihydrite at pH 4 and 30-minutes reaction time. The radiochemical yield and purity of 99mTc-cefprozil were evaluated after species separation individually followed by subsequent quantification of the free and complexed species. 4 mg of cefprozil was accurately weighed and transferred to an evacuated penicillin vial. Exactly 50 µg SnCl2 solution was added and the pH of the mixture was adjusted to 4 using 0.1N HCl, then the volume of the mixture was adjusted to one ml with N2-purged bidistilled water. One ml of freshly eluted 99mTcO4- (200- 400MBq) was added to the above mixture. The obtained maximum radiochemical yield was found to be 97.5% ± 0.8%. The 99mTc-cefprozil complex was stable for 6 hrs. The biological distribution of 99mTc-cefprozil was experimentally investigated in induced-infection mice, in the left thigh, using Staphylococcus aureus. T/NT for 99mTc-cefprozil was found to be 5.5±0.12 at 2 hrs after intravenous injection, which was higher than that of the commercially available 99mTc-ciprofloxacin followed by gradual decline. The abscess to normal muscle ratio indicated that 99mTc-cefprozil could be used for infection imaging. Moreover, 99mTc-cefprozil could efficiently differentiate between bacterial infection and sterile inflammation. Nuclear medicine scintigraphy (NMS) techniques are proving valuable in understanding the disease processes at molecular levels without the inconvenient invasive procedures, if a specific ligand is provided for a pathological process. The role of NMS in the diagnosis of infection and its discrimination from non-infective inflammatory processes and tumors at an early stage is clinically vital for appropriate management (Wouter et al. ; Sandip et al. ; David-Axel et al. ; Carrino et al. ). The radiolabeled leucocytes can be considered as gold standard for the identification of inflammatory foci in the intestine and bone tissues (Weiner ). The development of new radiopharmaceuticals that do not require the manipulation of blood and are able to differentiate between inflammatory and infectious processes with high sensibility and specificity is considered as the object of recent research. Therefore, other preparations such as 99mTc-nanocolloid, 67Ga-citrate, and 99mTc or 111In-labeled human polyclonal immunoglobulin are currently being tested (Buscombe et al. ). However, none of the preparations is capable of distinguishing between infections and inflammatory lesions in a clinically useful manner. Recently, a new proposal is based on the use of radiolabeled antibiotics. One of the most important radiopharmaceuticals which are now currently available for imaging infection, the antimicrobial agent ciprofloxacin labeled with 99mTc, has probably shown significant benefits. The fundamental problems of 99mTc-ciprofloxacin preparation discussed in the literature (Mcafee et al. ; (Akhtar et al. [2005, 2004]; Nibbering et al. ; El-Ghany et al. ) are related to radiochemical purity as well as to the stability of the labeled complex. So, other antimicrobial agents such as levofloxacin (El-Ghany et al. ), pefloxacin (Motaleb [2007a, b]), lomefloxacin (Motaleb [2007a, b]), cefoprazone (Motaleb [2007a, b]), cefuroxime (Yurt Lambrecht et al. ), rifampicin (Syed et al. ), and amoxicillin (Motaleb and Sanad ) were labeled with 99mTc to be used for imaging sites of infection and to overcome the drawback of 99mTc-ciprofloxacin (Kleisner et al. ; Yang et al. ). Cefprozil is a semi-synthetic broad-spectrum cephalosporin antibiotic. Cefprozil is a cis and trans isomeric mixture (≥90% cis). The chemical name of cefprozil is (6R,7R)-7-[(R)-2-amino-2-(p-hydroxyphenyl) acetamido]-8-oxo-3-propenyl-5-thia-1-azabicyclo [4.2.0] oct-2-ene-2-carboxylic acid (Petropoulos et al. ; Shaikh et al. ). Cefprozil has in vitro activity against a broad range of gram-positive and gram-negative bacteria. The bactericidal action of cefprozil results from inhibition of cell wall synthesis (Breier et al. ; Can ). In this paper, cefprozil was labeled with the most widely used imaging radionuclide, 99mTc. Factors affecting the labeling yield of 99mTc-cefprozil complex and biological distribution in inflammation bearing animals were studied in detail. Cefprozil was purchased from Sigma-Aldrich Chemical Company (St. Louis, MO, USA); its structure is presented in Figure 1. All the other chemicals were purchased from Merck (Whitehouse Station, NJ, USA), and they were reactive grade reagents. The water used is purged with nitrogen gas to give deoxygenated bidistilled water. The chemical structure of cefprozil. Cefprozil (4 mg) was accurately weighed and transferred to an evacuated penicillin vial. Exactly 50-μg SnCl2 solution was added, and the pH of the mixture was adjusted to 4 using 0.1 N HCl; then, the volume of the mixture was adjusted to 1 ml with N2-purged bidistilled water. One millimeter of freshly eluted 99 m TcO 4 − (200 to 400 MBq) was added to the above mixture. The reaction mixture was vigorously shaken and allowed to react at room temperature for a sufficient time to complete the reaction. This experiment was conducted to study the different factors that affect the labeling yield such as tin content (as SnCl2·2H2O), substrate content, pH of the reaction medium, and reaction time. For labeling process, trials were performed for each factor under investigation to obtain the optimum value. The experiment was repeated with all factors kept at optimum values except the factor under study, until the overall optimal conditions are achieved. The radiochemical yield of 99mTc-cefprozil was determined by paper chromatography, in which the reaction product was spotted on ascending paper chromatography strips (10 × 1.5 cm). Free 99 m TcO 4 − in the preparation was determined using acetone as the mobile phase. Reduced hydrolyzed technetium was determined by using ethanol/water/ammonium hydroxide mixture (2:5:1) or 5 N NaOH as the mobile phase. After complete development, the strips were dried, cut into 0.5-cm pieces, and counted in a well-type γ-scintillation counter. A simple, short, rapid, sensitive, and robust reversed phase high-performance liquid chromatographic (HPLC) method was developed and validated to measure the amount of cefprozil in dissolution profile. An isocratic elution of filtered sample was performed on cosmosil RP18 LiChrosorb column (250 mm × 4 mm, 5 μm, Merck) using water/acetonitrile solution (90:10, v/v) as mobile phase and at a UV detection at 200 nm. The mobile phase was delivered at a flow of 1.0 ml/min and at a maintained column temperature at 50°C, and quantification was achieved with reference to the external standards (Asikoglu et al. ). Then, fractions of 1.0 ml were collected separately using a fraction collector up to 15 ml and counted in a well-type γ-scintillation counter. 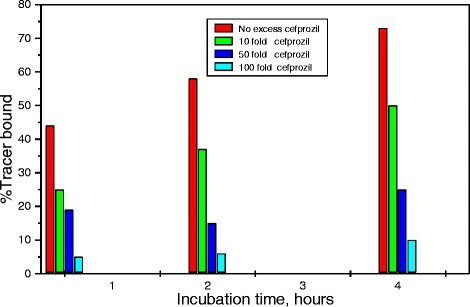 The stability of 99mTc-cefprozil was studied in vitro by mixing 1.8 ml of normal human serum and 0.2 ml of 99mTc-cefprozil and incubated at 37°C for 24 h. Exactly 0.2-ml aliquots were withdrawn during the incubation at different time intervals up to 24 h and subjected to paper chromatography for the determination of the percentage of 99mTc-cefprozil, reduced hydrolyzed technetium, and free pertechnetate. A single clinical isolation of Staphylococcus aureus (Boyd ) from biological samples was used to produce focal infection. Individual colonies were diluted in order to obtain turbid suspension. Groups of five mice, weighing approximately 25 g each, were injected with 200 μl of the above suspension in the left thigh muscle. Twenty-four hours was required to get gross swelling in the infected thighs. 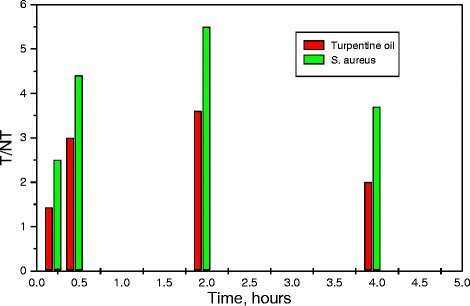 Sterile inflammation was induced by injecting 200 μl of turpentine oil (Robbins ), which was sterilized by autoclaving at 121°C for 20 min, intramuscularly in the left lateral thigh muscle of the Albino mice. Two days later, swelling appeared. Binding of 99mTc-cefprozil to S. aureus bacteria was assessed by the method described elsewhere (Welling et al. ). Briefly, 0.1 ml of sodium phosphate buffer containing about 5 MBq of 99mTc-cefprozil was transferred to a test tube. Exactly 0.8 ml of 50% (v/v) of 0.01 M acetic acid in phosphate buffer containing approximately 1 × 108 viable bacteria was added. The mixture was incubated for 1 h at 4°C and then centrifuged for 5 min at 2,000 rpm at 4°C. Simultaneously, the incubation was performed in the presence of an excess of unlabeled cefprozil (10-, 50-, 100-fold). The supernatant was removed, and the bacterial pellet was gently resuspended in 1.0 ml of ice-cooled phosphate buffer and recentrifuged. The supernatant was removed, and the radioactivity in the bacterial pellet was determined by a γ-counter. The radioactivity related to the bacteria was expressed in percentages of the added 99mTc activity bound to viable bacteria in regard to the total 99mTc activity. The study was approved by the animal ethics committee of the Labeled Compound Department and was in accordance with the guidelines set out by the Egyptian Atomic Energy Authority. For the infection model, the animals, Swiss Albino mice (25 to 30 g), were intravenously injected with 100 μl (100 to 150 MBq) of sterile 99mTc-cefprozil, adjusted to physiological pH via the tail vein, and kept alive in metabolic cage for different intervals of time under normal conditions. For quantitative determination of organ distribution, five mice were used for each experiment, and the mice were sacrificed at different times post-injection. Samples of fresh blood, bone, and muscles were collected in pre-weighed vials and counted. The different organs were removed, counted, and compared to a standard solution of the labeled cefprozil. The average percent values of the administrated dose/organ were calculated. The blood, bone, and muscles were assumed to be 7%, 10%, and 40%, respectively, of the total body weight (Motaleb ). Corrections were made for background radiation and physical decay during experiment. Both target and non-target thighs were dissected and counted. Differences in the data were evaluated with Student t test. Results for p using the two-tailed test were reported, and all the results are given as mean ± SEM. The level of significance was set at P < 0.05. In case of ascending paper chromatographic method, acetone was used as the developing solvent, free 99 m TcO 4 − moved with the solvent front (Rf = 1), while 99mTc-cefprozil and reduced hydrolyzed technetium remained at the point of spotting. In the case of ascending paper chromatographic method, the mixture was used as the developing solvent; reduced hydrolyzed technetium remains at the origin (Rf = 0), while the other species migrate with the solvent front (Rf = 1). The radiochemical purity was determined by subtracting the sum of the percentage of reduced hydrolyzed technetium and free pertechnetate from 100%. The paper electrophoresis pattern revealed that the 99mTc-cefprozil complex moved towards the anode, indicating the anionic nature of this complex. Under similar condition, 99 m TcO 4 − moved considerably toward the anode, suggesting that it has a completely ionized negative charge. An HPLC chromatogram was presented in Figure 2 and showed two peaks, one at fraction no. 3.25, which corresponds to 99 m TcO 4 − , while the second peak was collected at fraction no. 7.3 for 99mTc-cefprozil which was found to coincide with the UV signal. HPLC radiochromatogram of 99m Tc-cefprozil complex. As shown in Figure 3, relatively low labeling yield of 99mTc-cefprozil, 75.3% ± 0.4%, was obtained at low ligand concentration (1 mg). 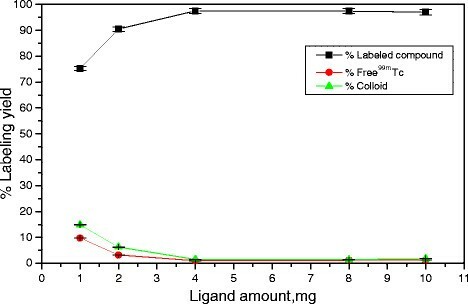 This low labeling yields was attributed to the ligand concentrations being insufficient to form the complex with all of the reduced technetium-99m, while the percentage of the colloid was high 14.9% ± 0.5%. Increasing the ligand concentration led to higher labeling yield, and the maximum yield (97.5% ± 0.8%) was achieved at 4 mg. By increasing the ligand concentration over the optimum values, the labeling yield remained stable. Effect of cefprozil amount on the labeling yield of 99m Tc-cefprozil complex. Conditions: 1 to 10 mg of cefprozil, 50 μg Sn (II), pH 4, and 30-min reaction time; n = 3. The effect of the amount of stannous chloride was summarized in Figure 4. The data showed that the radiochemical yield was dependent on the amount of SnCl2·2H2O present in the reaction mixture. At 25 μg SnCl2·2H2O, the labeling yield of 99mTc-cefprozil was 65.6% ± 0.71% due to insufficient SnCl2·2H2O concentration to reduce all pertechnetate, so the percentage of 99 m TcO 4 − was relatively high (Guarna et al. ). The labeling yield was significantly increased by increasing the amount of SnCl2·2H2O from 25 to 200. At 50 μg (optimum content), the maximum labeling yield of 97.5% ± 0.8% was obtained. 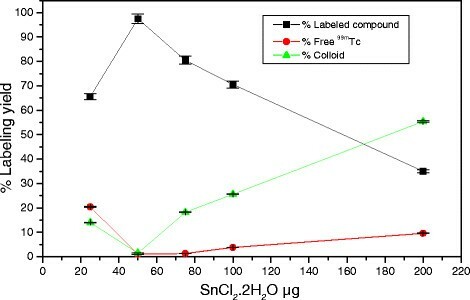 By increasing the amount of SnCl2·2H2O above the optimum concentration value, the labeling yield decreased gradually due to the conversion of the excess SnCl2·2H2O to colloid and reached to 55.4% ± 0.82% at 200 μg SnCl2·2H2O (Seung et al. ). Effect of Sn (II) amount on the labeling yield of 99m Tc-cefprozil complex. Conditions: 4 mg cefprozil, 25 to 200 μg Sn (II), pH 4, and 30-min reaction time; n = 3. As shown in Figure 5, at pH 1 the labeling yield of 99mTc-cefprozil complex was relatively low (50%). The yield increased with increasing pH of the reaction mixture, reaching the maximum labeling yield of 97.5% ± 0.8% at pH 4. 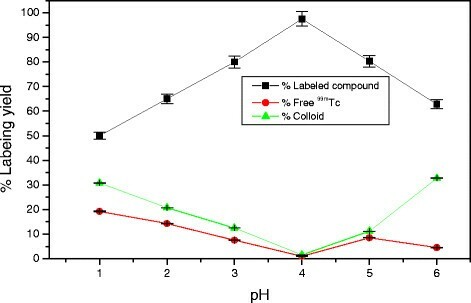 By increasing the pH greater than 4, the labeling yield decreased again to 62.8% at pH 6, at which the colloid impurity percentage becomes high (32.7% ± 0.3%) (Motaleb et al. [2012, 2011]). Effect of pH on the labeling yield of 99m Tc-cefprozil complex. Conditions: 4 mg cefprozil, 50 μg Sn (II), pH 1 to 6, and 30-min reaction time; n = 3. 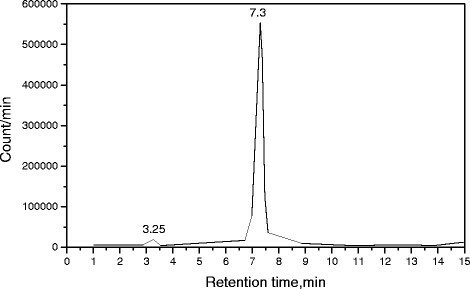 Figure 6 shows the effect of incubation time on the radiochemical purity of the 99mTc-cefprozil complex. At 1-min post labeling, the radiochemical purity reached to 80.6% ± 0.7%, which increased with time until reaching its maximum value of 97.5% ± 0.8% at 30 min. The radiochemical purity remains stable for up to 2 h (Ibrahim and Sanad ; Sanad and Ibrahim ). 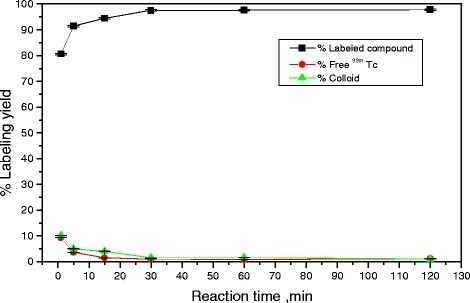 Effect of reaction time on the labeling yield of 99m Tc-cefprozil complex. Conditions: 4 mg cefprozil, 50 μg Sn (II), pH = 4, 1- to 120-min reaction time; n = 3. 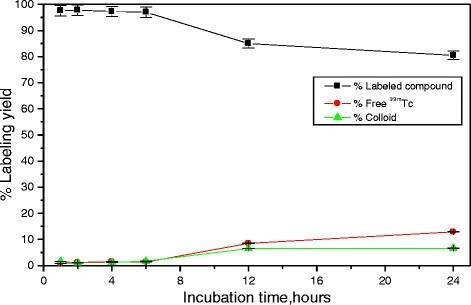 As shown in Figure 7, the in vitro stability of 99mTc-cefprozil was studied in order to determine the suitable time for injection to avoid the formation of the undesired products that result from the decomposition of the complex. These undesired radioactive products might be accumulated in non-target organs. The results of the stability test showed that the 99mTc-cefprozil is stable for 24 h at 37°C which resulted in a small release of radioactivity of 17.0% ± 0.3% (n = 3 experiments) from the 99mTc-cefprozil, as determined by paper chromatography. In vitro stability of 99m Tc- cefprozil in normal serum at optimum condition. In vitro binding studies revealed that the binding of 99mTc-cefprozil to S. aureus bacteria was similar to that of 99mTc-ciprofloxacin, where the binding of 99mTc-cefprozil was in the range from 42% to 73% (n = 5), while the binding of 99mTc-ciprofloxacin was in the range from 40% to 65% (n = 3). The varying amounts of cefprozil added (10- to 100-fold) showed significant decrease in the binding of 99mTc-cefprozil to living bacteria, indicating that the 99mTc-cefprozil complex is a specific agent for bacterial cells (Figure 8). In vitro binding of 99m Tc-cefprozil to Staphylococcus aureus . Table 1 shows the biodistribution of 99mTc-cefprozil in important body organs and fluids. 99mTc-cefprozil was removed from the circulation mainly through the kidneys and urine (approximately 42.79% injected dose, ID, at 4 h after injection of the tracer). The liver uptake decreased markedly with time from 15.33% at 15 min to 6.9% at 4 h. The mice with infectious lesions injected with 99mTc-cefprozil showed a mean target-to-non-target (T/NT) ratio equal to 5.5 ± 0.12 which is greater than that of 99mTc-ciprofloxacin (T/NT = 3.8 ± 0.8) (Ibrahim et al. ). The accumulation of activity at the site of infection was maximized at 2 h after intravenous injection then slightly decreased with time until T/NT was equal to 3.70 ± 0.03 at 4 h post injection. During the first 2 h, the radioactivity level in the blood was higher than that in the inflammation-induced area. This means that the images of 99mTc-cefprozil by gamma camera will be affected by the blood pool images that arise from the high blood activity. Therefore, it is recommended to obtain more specific images for 99mTc-cefprozil after 4 h (Figure 9). T/NT of 99m Tc-cefprozil complex in different inflammation models at different post injection times. 99mTc-cefprozil was labeled easily using 50 μg SnCl2·2H2O as a reducing agent at pH 4 and 30-min reaction time with high labeling yield of 97.5% ± 0.8%. The 99mTc-cefprozil complex was stable up to 6 h, which shows high stability time in comparison to ciprofloxacin. Based on the data obtained from the biodistribution of 99mTc-cefprozil, it can be stated that there is a significant difference in the percentage uptake of 99mTc-cefprozil in the muscle injected with S. aureus and turpentine oil, which indicated that 99mTc-cefprozil is considered as a specific agent and could distinguish between bacterial infection and sterile inflammation. This result was supported by the data from in vitro binding of 99mTc-cefprozil with bacteria. EHB Make the analtycal parts. MHS makes the rest of manuscript. Both authors read and approved the final manuscript.